Like many devices in the home, TVs and audio systems are becoming more advanced. TVs are leading the way for innovating great home entertainment systems, from ultra HD 4K to 8K, but in parallel TVs are designed with thinner panels. Thinner TVs lack sufficient depth to add the high-quality speakers that could potentially have the biggest effect on home entertainment experiences. 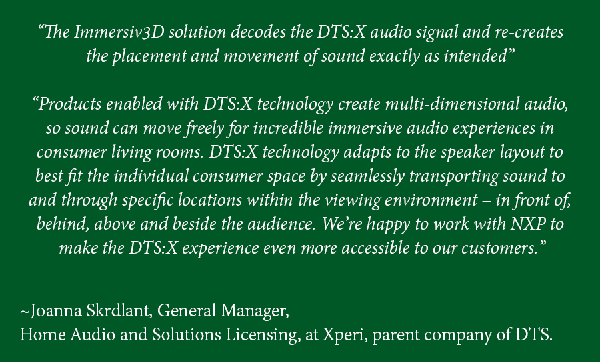 Sound has been progressing by leaps and bounds in recent years, thanks in large part to the development of Dolby Atmos® and DTS:X®. Dolby Atmos is a leap forward from surround sound and transports listeners with moving audio that fills the room and flows all around them. Listeners will feel like they’re inside the action as the sounds of people, places, things, and music come alive with breathtaking realism. Unveiled at CES January 8, NXP’s Immersiv3D audio solution for the smart home market ignites a new era of audio system design and development. The solution combines ground-breaking NXP software on the i.MX 8M Mini applications processor and will support both Dolby Atmos® and DTS:X®, in future devices that integrate the i.MX 8M Mini SoC. The i.MX 8M Mini also brings smart capabilities like voice control to a broader range of consumer devices including soundbars, smart speakers, and AV receivers with the option for adding additional speakers to distribute smart voice control and immersive audio throughout the home. Conventional design approaches to audio systems use Digital Signal Processors (DSPs) to deliver complex, controlled, and low-latency audio processing to enable audio and video synchronization. Traditional embedded systems have evolved over time, and today, are capable of processing the latest 3D audio formats, but audio systems need to be designed to take advantage of today’s advanced processor cores. In conjunction with the NXP i.MX 8M family of processors, the innovative Immersiv3D audio solution introduces a brand-new approach that features scalable audio processing integration into the System-on-Chip (SoC) Arm® cores. This approach eliminates the need for expensive discrete DSPs, and also once-proprietary DSP design foundations, to embrace licensable cores. As a result, the combination of NXP’s innovative software and hardware allows customers to dramatically cut development cost, accelerate time-to-market, enable high fidelity audio and capability to add new smart and connected features. The solution delivers high-end audio features such as immersive multi-channel audio playback, natural language processing and voice capabilities to fit today’s digitally savvy connected consumer. 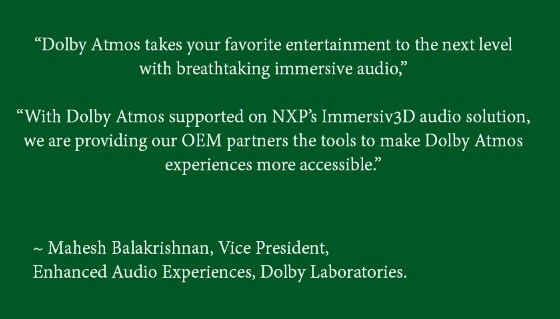 The NXP Immersiv3D audio solution gives audio developers, designers and integrators a leap forward to add intelligence and Artificial Intelligence (AI) functionality while reducing cost. This includes development of enhancements like selective noise canceling where only certain sound elements are removed like car traffic, or speech processing like changing speaker dialect or languages. Additionally, the solution introduces one of the market’s easiest-to-use, low-cost enablement for voice capability expansion. 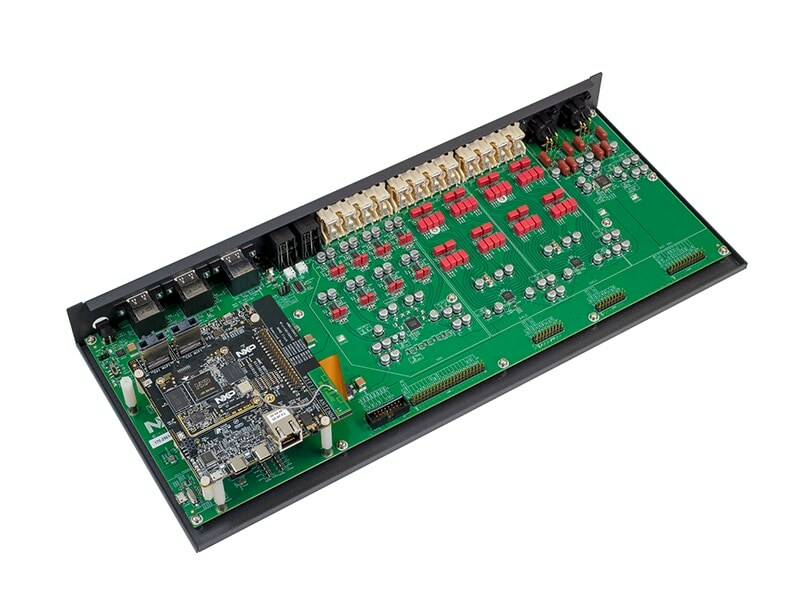 Audio systems built using NXP’s Immersiv3D with the i.MX 8M Mini applications processor will give consumers the flexibility to add different audio speakers, regardless of brand, to stream simultaneous and synchronized audio with voice control from their systems. For more information, please see the full announcement here or contact a local NXP sales representative.